Happy Christmas to all customers! It’s been a great year, thank you. It may be Christmas, but we don’t stop working. (The website, is of course, online 24/7), and there is usually someone here to answer queries or take orders. If not, do leave a message and we will get back to you usually the same day. Emails are checked several times daily. Recently we were asked about die letters. 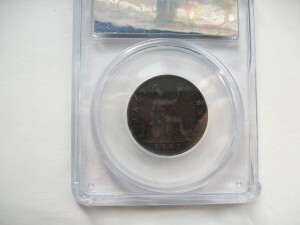 These occur rarely, but notably do so on the 1862 Half Penny. The letters A, B, and C are placed by the lighthouse. These letters were used so the Royal Mint could gauge how quickly the Half Penny dies were wearing. Die letter C, is the rarest, followed by die letter B, with A being the commonest, though still exceedingly rare. We've actually got all 3. For those looking to buy one, at the top end we have a die letter C slabbed by CGS VF40 for £3250, if your budget doesn’t stretch that far, we can do you die letter A or B, in Fair to Fine for £550. 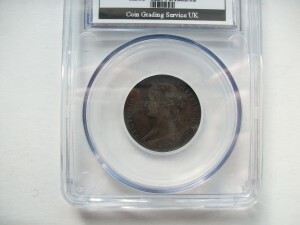 If you would like to take a look at our complete range of Half Pennies you will see many other interesting varieties and dates as well. We hope to hear from you in 2016, if not before!